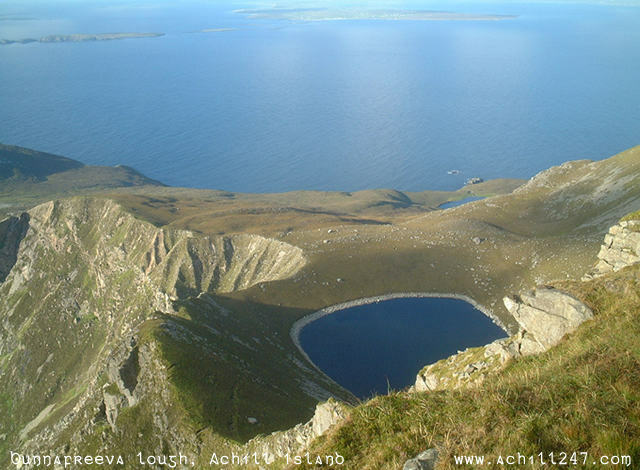 Lough Bunnafreeva West is located above Saddle Head on the rugged north-facing cliffs of Croaghaun on Achill Island. Bunnafreeva West, a corrie lake situated some 350m above sea level, was remarked upon by the London publisher Edward Newman back in 1838: "Near the margin of the cliff a beautiful little fresh-water lake, surrounded by an amphitheatre of hills. I should think its surface was 600 feet above the sea, and its distance from the edge of the cliff scarcely 300. I doubt whether any Englishman but myself has ever seen this lone and beautiful sheet of water; its singularly round form, the depth of the basin in which it reposes, the precipitous sides of the basin, its height above the sea - all these are characters of no ordinary interest". (quoted in R.L. Praeger, 'The Way That I Went', 1937). The photograph below was taken from the top of the cliffs at Croaghaun. Beyond the rim of Lough Bunnafreeva West can just be seen part of Lough Nakeeroge West which, along with Lough Nakeeroge East (out of picture), are the two lowest corrie lakes in Ireland. In the far distance can be seen Blacksod Bay and the Belmullet peninsula (top centre), and the islands of Duvillaun (top, left).